Wow, it's been so long since I've played in my craft room. I think I lost my mojo there for a while and I'm hoping that it returns soon as I haven't started my Christmas Cards yet and Christmas is in how many days??? I guess I really need to find the time to sit down and create. I've got 10 days off at the end of the month but I think by then it may be too late. Anyways, this is a card that I made for a Co-Worker friend. She was going through a bit of a rough patch and I thought maybe a little Tilda was in order and would hopefully put a smile on her face. It did just that and a few tears as well. You have to love when someone really appreciates the time and effort that go into making a homemade card for them. I also wanted to extend my thoughts and prayers to all those who were affected by Hurricane Sandy. My heart breaks for them as I know all to well how lives can be devastated. God Bless. Beautiful card! Lovely design. Your coloring is beautiful. Love all the wonderful goodies you have added. How thoughtfully you were to your friend. Wouldn't it be great if everyone loved our work so much. Oh Julie, your friend is so fortunate that you thought to make this beautiful card for her. It is so nice when someone is appreciative of all the work put into an item. GOR-JUS! Tilda is lovely, Julie. I love all the pink papers and coloring. Gorgeous card. Gorgeous card, I love your pink, great job. This is gorgeous! I don't think you've lost your mojo at all. One of my fave Tildas and you've coloured her beautifully. Love your layout and gorgeous flowers. Terrific distressing job. Sweet card. Lovely colors and coloring. This is very pretty in pink! Your Mojo is not lost! This is totally beautiful! Your friend will treasure this piece of art! Wow!! this is so very pretty, your colouring and design are fabulous. This is a joyful and gorgeous card for your friend. I love it and you never lost your creativity, you are a natural. What a beautiful card dear!!! Of course your friend would love this. Absolutely gorgeous!!!!! Superb coloring and design work! This is absolutely GORGEOUS! I looooooooove it!!!!! 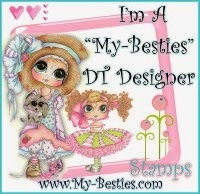 So very pretty, Love your card design and colors. Oh goodness, this is a gorgeous card and definitely will put a smile on your co-workers face. Beautiful!! Julie, I bet your friend loved this cute fun sweet pink card. It's so good to see you post! Have fun making your Christmas cards and enjoy your time away from work.